Kirby was always a simple video game character. He was a pleaser. Today, he's a rebel. In the vintage of his heyday, one that Nintendo has attempted to uncork again with this season's Wii game, Kirby's Return to Dreamland, Kirby charmed players by being cute. He was—and is again—a pink blob with puffed cheeks and stubby arms, running around to a lullaby soundtrack. He won gamers over in 1992 by making them happy. We still need that. Kirby wasn't just about joy. From the start, the Nintendo character made the people who controlled him on Game Boys, Super Nintendos and DSes feel powerful. That could have made Kirby the forefather to today's major video games, so many of which are made to please their players by granting them great power and a feeling of accomplishment, without making them sweat. Yes, modern video games are, by default, easy, as easy as so many Kirby games have been. But Kirby was too sweet to spawn today's interactive explosion-detonators and blood-spillers. Kirby's powerfulness was more bubble-blower than chainsaw, more gentle, magical, wondrous potency than the kind of ripping, shredding power favored by today's shooters, the racers, the brawlers and the rest. He too may star in easy games, but Kirby doesn't fit in these days. He is bald but he's hardly badass and doesn't grit his teeth. Nintendo seems undeterred. With his cheeks puffed and eyes wide open, he is back. But his return this time seems to be as if by accident, as part of an unexpected renaissance from his caretakers at Nintendo. He's part of a 21st-century movement by Nintendo that has progressed from simply reclaiming the value of simplicity in video games to reviving an entire genre, sidescrollers, the genre that Super Mario Bros. helped make famous. It's a genre even Nintendo seemed tired of a decade ago but back they are, returning Kirby, in a jolly manner, to his most comfortable territory. Kirby's Return to Dreamland is a strange game to be playing in 2011. It's a simple side-scroller and a nostalgia device. Kirby can inhale his enemies, as he could in his first game, and absorb the powers of many of them, as he could in many Kirby sequels. He can float forever, flying through levels without much conflict or thump his enemies with his cute ninja stars, microphone yells, hammer hits, leaf walls or whatever other cartoony powers he temporarily obtains via enemy-inhalation. The Return to Dreamland player won't find much friction in this game if they don't want to, but almost all Kirby games have been easy if you wanted them to be. To dislike easy games would be to dislike modern video games and most Kirby games. There's no need for that. You can call the new game fan service, a love letter to people who love Kirby or a time capsule unearthed and re-polished. Return to Dreamland is a playground for Kirby's oldest fans who will probably be delighted that this new game feels so much like some old favorites. The game's music, sound effects, character designs and powers are all throwbacks, as is the core of what you do in this game, to early Kirby adventures. Kirby can indeed still be a charmer. He's adorable in this game, even when he's grabbing his enemies in a grapple that only Kirby could make look like a hug, leaping into the air with them, spinning around and spiking them on the ground. Kirby kills with kindness, the kind of kindness that licenses him to, every few levels, get a mega-sized version of one his powers and start smashing his enemies with a screen-filling mallet or giant sword (because Kirby games are comedies, sometimes that giant sword just happens to manifest itself as a giant fish; and sometimes the power that Kirby snatches doesn't make him a mightier warrior but, rather, makes him take a nap). But just as Star Wars for some audiences is the adventures of Anakin, not Luke, so too has Kirby developed a new fanbase for his recent role as playful lab assistant. Kirby, of late, has been the character Nintendo has used for some of its most interesting game design experiments. He was a pioneer of motion control when he starred in the pre-Wii motion-sensitive game Kirby Tilt 'N Tumble. He was the test blob in Kirby's Canvas Curse for an action game on the DS that could be controlled entirely with a stylus—and with the player drawing the path for the hero to travel across. Kirby has taken so many breaks from inhaling his enemies and gaining their powers that he's waddled to the tip of Nintendo's design spear. Last year he was part of an unusual graphical experiment, starring in a Wii game, Kirby's Epic Yarn, that tested the concept of a virtual world that both looked and behaved as if it was stitched and knitted from fabric, thread and yarn. Just two months ago he was part of yet another experiment that could be summarized as: What if there were 10 Kirbys at once? There are no experiments in Kirby's Return to Dreamland. He's out of the lab in this one, back to his roots. It's arguable if that that plays against Kirby's type or into it. What defines this little guy? The answer is probably his agreeability and pliability. A spherical character is ideal for dropping in all sorts of new rolling roles. One who inhales others' identities is ready for repeated transformation, even a transformation to what made him popular at the start. In journeying back, however, Kirby skips behind the progress of Nintendo's sidescroller revivalists. His game isn't just easy and simple; it's basic. His levels do pack hidden items that unlocks some enjoyable side adventures, but the level design in Return to Dreamland seldom surprises nor winks at its player. The hiding spots for Kirby's extras are obvious and in a contrast to last year's game, are unpacked or unlocked with little charm. This is an intangible distinction, but my own recent return to Epic Yarn confirmed my tastes that levels randomly picked from last year's Wii game are more delightfully surprising and unconventional in their unfolding than the standard patterns of progression offered in Return to Dreamland. Too much of this new game feels stock and standard. In the past 12 months, Nintendo has released three side-scrollers for the Wii, a total equal to the number they ever sold for the half-decade lifespan of Nintendo 64. This was a genre that they had originally championed through their first two consoles, not just with Super Mario Bros. games but with Metroids, Kirbys and even a Zelda. They kept making side-scrollers for their portable game machines, but as if that was a concession to the limits of handheld technology, they switched their focus to making three-dimensional games as soon as the N64 launched in 1996. Mario games switched from being run-to-the-right side-scrollers to being run-deep-into-a-world-in-your-TV 3D games. Metroid became a first-person shooter, Kirby a 3D platformer (Correction: No, Kirby did remain a side-scroller on the N64, but his game did appear more polygonal and 3D-ish. But Donkey Kong, in fact, did become a 3D platformer, after having a hit side-scrolling series a generation earlier.). The competition followed. Sonics went 3D. Castlevania tried to. Nintendo brought back sidescrollers for their consoles to make oddities like Donkey Kong Jungle Beat, a game played with a controller shaped like bongo drums. The sidescroller was no longer a big deal. It was a relic of old tech. In 2006, Nintendo launched the Wii with Wii Sports a simplified game of tennis, bowling and other activities meant to be played with swings of the arm and flicks of the wrist. The game's motion-control got the headlines and the praise, but the appeal of such a simple game was surely important. That same year, Nintendo made a new side-scrolling Super Mario Bros. game for the DS and soon was selling millions of copies of it, year after year. Motion control was overrated. It wasn't the sole means to Nintendo's end of attracting people with simpler games. Nintendo proved to be inconsistent with its development and embrace of motion controls on the Wii, but its resurgent Mario Bros. sidescrolling appeared to inspire the company to repeat the side-scrolling success on the Wii. Having already produced a side-scrolling Mario game for the Wii and a clumsy side-scroller starring Wario, Nintendo made its centerpiece game for 2009 a side-scroller, the first side-scroller that had been a centerpiece game for a Nintendo system since the Donkey Kong Country games of 1994-1996. That new game, New Super Mario Bros. Wii, was a massive hit. Simplicity worked. It even outsold two 3D Mario games released on the Wii. The public preferred the sidescrollers. After that new Mario Bros. came Nintendo's surprise twin-sidescroller holiday season of 2010, featuring both Kirby's Epic Yarn and Donkey Kong Country. Neither game used motion control in any significant way; the value of arm-swinging apparently was debatable. The value of side-scrolling was not. The genre that Nintendo had boosted and then neglected was suddenly its bread and its butter again. Return to Dreamland probably completes this phase of Nintendo's sidescroller revival. The Wii is nearly exhausted, set to be replaced by the more powerful Wii U within a year. The new game invites comparisons to the other games in its vanguard, and compared to those others, if its nostalgia appeal is disregarded, it falls short. Its level design is both less surprising and less beautifully-drawn. Like the other Wii side-scrollers, Return to Dreamland supports couch multiplayer, but doesn't improve the experience, simply repeats what has become a new Nintendo side-scrolling standard. The game doesn't achieve its potential. Its presentation of many fun new powers could have distinguished it, but the wielding of them is more joyful than relevant. Kirby has sets of sets of moves. He's just bursting with abilities, each time he inhales some bad guy. But the use of those moves is almost entirely optional, save for a few that are needed to cut a rope, burn ice or otherwise access a hidden bauble. In one of Kirby's unlockables, a batch of rooms each tied to a specific Kirby power, we get a glimpse at a more interesting Return to Dreamland. In those rooms, the game is played for points. The Return to Dreamland player is required to and rewarded for using their powers well. You're going for a high score, the most retro goal of all, but you're doing it with cheerful flair, which feels so eternally Kirby. Elsewhere, Return to Dreamland offers unlockable motion-control games which serve only to remind us of the mistaken 2006 idea that motion control was essential for Nintendo to achieve success by re-popularizing simplicity. Return to Dreamland also offers an unlockable battle arena and a second, harder playthrough, both of which confirm that this game isn't lacking for content. To some eyes Kirby's adventures will always appear childish and therefore possess, at best, a temporary appeal. He is so cute, so pink, so ready to camouflage himself beside a kindergarten xylophone, that one could suppose he is made to be outgrown. He is an irrepressible charmer whose value is in ignoring the browns and grays of gaming's more grown-up tones. He's the character built best to offer delight without rancor and brutishness. 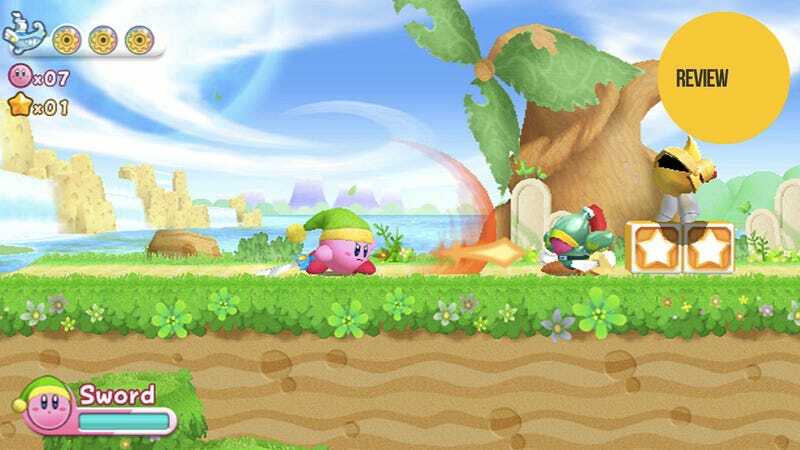 The ease of Kirby's games is no demerit, as he is spawned from an entire genre of game that had been wrongly jettisoned for many years only to return when it could again be appreciated. Simplicity—separate from easiness—is that genre's virtue. Coupled with that is the virtue of delight. Games as path to quick happiness is a value, and so Kirby games will always command my attention. Uninteresting level design, however, is not a virtue. It wars with the appeal of nostalgia in Return to Dreamland. The kids of Kirbys past may thrill to the new game, but for those of us who champion Kirby solely as a progressive, who wish even his return to his classic powers to in some way embody the experimental edge this smooth puffball has somehow attained, this game is a temporary stall of disappointment. It's hard to frown at Kirby. He's always smiling. But it's easy to look more forward to his next adventure and hope he never goes away.